House Speaker Shap Smith (D-Morristown) and other top Democrats plan to schmooze with lobbyists Wednesday night at a Montpelier fundraiser to benefit the political action committee they run. Now two Republican House members say they're hoping to ban the practice. Individual legislators are currently barred from raising money from registered lobbyists and the companies that employ them until after the legislature adjourns at the end of the two-year biennium. But Vermont Democrats and Republicans alike have long exploited a loophole allowing them to raise lobbyist cash through the PACs they control — even while the legislature is in session. Those PACs then spend the money on electoral activities. Reps. Kurt Wright (R-Burlington) and Patti Komline (R-Dorset) say they plan to introduce legislation later this week that would extend the restrictions to political parties and PACs. "We think that practice ought to be banned," Wright says. The two Republicans say they were inspired to act last April when Smith and his fellow House Democrats invited lobbyists to a $500-a-head fundraiser just days before the legislature adjourned. Komline says the timing of that fundraiser — as legislators finished work on the budget and tax bills — "gave the appearance of pay-to-play." "That's when we realized it was egregious," she says. Adds Wright, "I don't think there should be any hint even that somebody writes a $500 check or $1,000 check or whatever it is and they get some special consideration here in the closing days of the session — or at any time during the session." 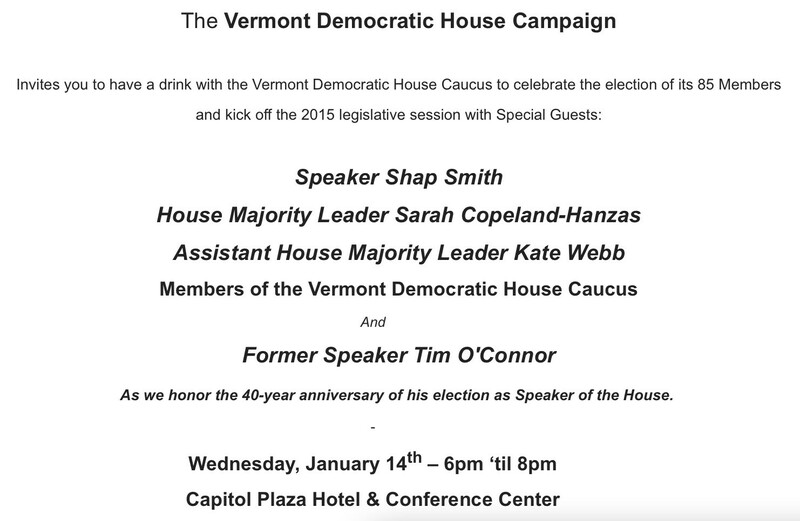 As we reported in this week's Fair Game, the Vermont Democratic House Campaign, a political action committee run by Smith and other top Democrats, is scheduled to host a "Speaker's Soiree" Wednesday night at Montpelier's Capitol Plaza. An invitation for the event notes that special guests include Smith, House Majority Leader Sarah Copeland Hanzas (D-Bradford) and House Majority Whip Kate Webb (D-Shelburne). The House Dems plan to honor former representative Tim O'Connor, who was elected speaker 40 years ago this week. House Dems are charging $100 for admission and $1,000 to sponsor the event. Seven Days obtained a copy of an invitation in which Vermont Democratic House Campaign director Katherine Levasseur personally solicited a registered lobbyist to attend. House Speaker Shap Smith declined to comment Wednesday on Wright's and Komline's legislation. But in an interview with Seven Days on Monday, he defended taking part in the Speaker's Soiree. “I would prefer that we are not raising money at any time during the legislative session," Smith said. "This is within the rules, and it's historical practice that has been going on for a really long time." Komline herself has previously served as House minority leader. She says the House Republican PACs, too, have raised money from lobbyists during the session. "We're not holier than thou on this," she says. Rep. Chris Pearson (P-Burlington), who heads the House Progressive caucus, says he plans to co-sponsor Wright's and Komline's bill. "You can't be weighing in on legal and policy decisions as you're asking people for money. I think most people understand that's a bad idea and could potentially very directly lead to corruption," Pearson says.